The bride sits down for a few individual portraits once she’s all dolled up. In this photograph, the bride hints at a smile as she gazes into the camera. Her green eyes match the color of sea foam that will be in the background of the wedding ceremony on the beach. Thanks to makeup artist Carisa Didoshak, Erica is showing off her natural beauty with light makeup that accentuates her already gorgeous features without overdoing it. It’s important for the bride to find a balance with her makeup that makes her feel confident, hides any blemishes, but that also stays true to her naturally beautiful looks! 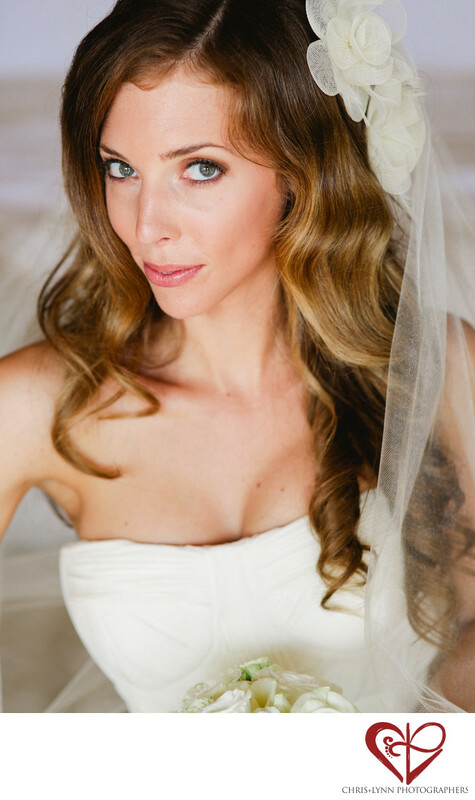 Perfect for a beachside ceremony, the bride’s hair falls in gentle waves that settle in barrel curls. Her white hairpiece, translucent veil, and white bouquet emphasize the bride’s light, golden skin tone. With these photographs, we aim to capture the bride’s beautiful wedding day look that she will remember fondly for the rest of her life. 1/500; f/2.8; ISO 400; 85.0 mm.